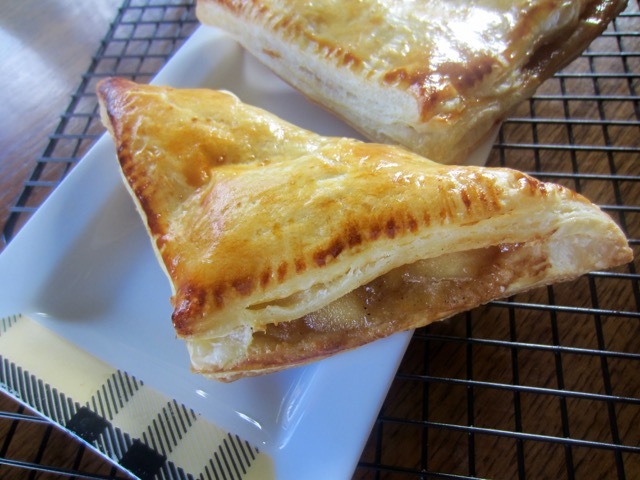 I used homemade rough puff pastry to make these turnovers. It’s very easy to make. You can also use ready-rolled pastry. Just roll each sheet into a 12-inch square and you’re good to go! Prepare the pastry one day ahead of time. Preheat the oven to 425ºF (220ºC) ten minutes before using. You can also buy ready-rolled pastry and pre-heat your oven to the temperature indicated on your product. Divide the prepared puff pastry into two (each portion will be 300g (10.5oz). Keep one portion in the fridge and roll the remaining into a 12 x 12 inch (30 x 30cm) square about 2-3mm (1/16-1/8 inch) thick. Place on a baking sheet lined with parchment and chill for 20 minutes. Roll the remaining portion and chill for 20 minutes. If using ready rolled pastry. Roll each sheet into a 12-inch square. Trim edges of the 12-inch pastry square if necessary and cut into 4 squares. Brush each square with egg wash and spoon about 1/8 filling onto each half of the square. Fold dough over the filling and press edges with a fork to seal. Place finished turnovers in the fridge and work on the remaining 4. Chill for 20 minutes before baking. Brush the turnovers with eggwash, poke 4-6 times on top with a fork or make three slits on top and bake 15-20 minutes or until golden brown and puffed up. Cool on a wire rack and serve warm with fresh whipped cream or ice cream or on its own. Turnovers are best eaten fresh. Please make sure the pastry remains cold at all times otherwise it will not puff up when baked. If at anytime it feels soft when being handled then chill it. If you use store-bought pastry then use the recommended temperature to bake it. I made only 4 turnovers. Heat the butter over high heat until it turns brown. Add the apples, sugar and cinnamon and cook over high heat for 5-6 minutes, turning two-three times only, so the apples can caramelize. (Make sure the liquid is evaporated and the sugar has caramelized) Remove from heat and transfer onto a plate lined with parchment paper to cool completely. Divide the prepared puff pastry into two (each portion will be 300g (10.5oz). Keep one portion in the fridge and roll the remaining into a 12 x 12 inch (33 x 33cm) square about 2-3mm (1/16-1/8 inch) thick. Place on a baking sheet lined with parchment and chill for 20 minutes. Roll the remaining portion and chill for 20 minutes. Trim edges of the 12 x 12 pastry square if necessary and cut into 4 squares. Brush each square with egg wash and spoon about 1/8 filling onto each half of the square. Fold dough over the filling and press edges with a fork to seal. Place finished turnovers in the fridge and work on the remaining 4. Chill for 20 minutes before baking. Brush the turnovers with eggwash, poke 4-6 times on top with a fork and bake 15-20 minutes or until golden brown and puffed up. Cool on a wire rack and serve warm with fresh whipped cream or ice cream or on its own. Turnovers are best eaten fresh. 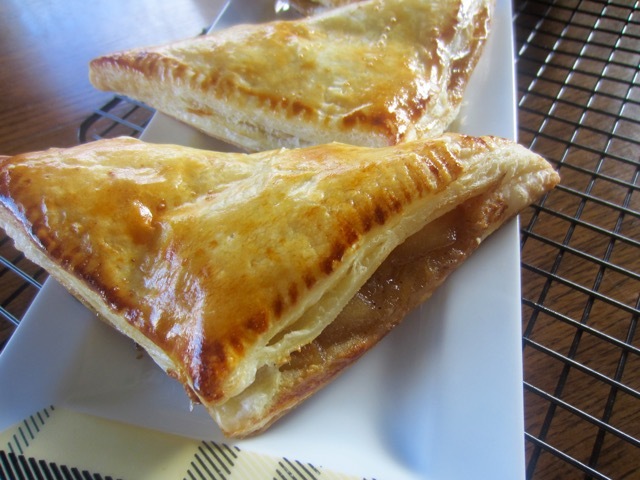 Your turnovers are beautiful and must have been delicious! Can I just move in with you please??? So I can happily munch on all these delicious treats with no guilt because you’ll be munching right along side of me hee-hee! That would really help. I need an extra mouth for all this food I make. I have to literally sit my kids down and SAY NOW EAT EVERYTHING…to much blog food hanging around!!! They do and they eat a lot so that helps! You should try it out. The rough puff is so easy to make. I have been trying classic puff pastry the last few days and the last one I made was totally awesome. I was jumping up and down like a 2 year old in a Candy shop. Keep me posted! Just made some puff pastry for chicken pot pies. They’re in the oven right now. My dinner is a tad late. Oh no we ate, licked our fingers and washed the small ovenproof dishes. Today we’re making Basmati rice with chicken. Have a lovely week! These look amazing!! I LOVE apple everything. 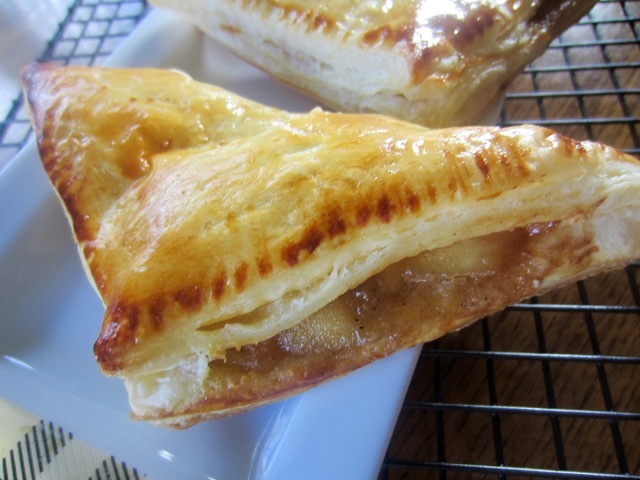 An apple turnover in Australia is a little different. We still use sweet puff pastry and some stewed apple, but we use a lot of sweetened whipped cream. Oh boy that sounds like what I would love to eat for dessert. I hear you! 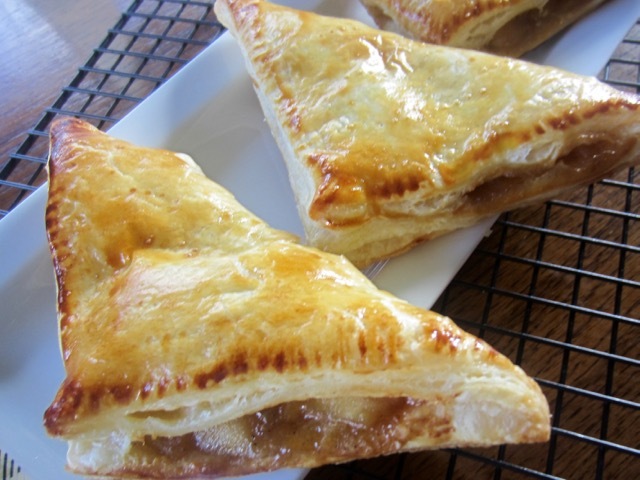 Beautiful turnovers!! Love the Apple ones!